Powers/Abilities: After being enhanced by Extremis, a modern biotechnological version of the Super-Solder serum, Mallen's genome was rewritten, granting him enhanced strength, invulnerability, the ability to breath fire, enhanced durability, super-speed, and a super human physique. (Iron Man IV#3 (fb)) - Young Mallen sat helplessly in the corner as his parents and relatives discussed the government closing in around them for illegal arms operations. His family was all shot and killed by the government officials. (Iron Man IV#6 (fb) - BTS) - Mallen joined a group of domestic terrorists seeking to destabilize the government. They soon received the stolen Extremis, a super-soldier injection that would grant its user vast super human powers. (Iron Man IV#1) - In Bastrop, Texas, ignoring any reservations he may have had, Mallen had Beck inject him with the Extremis. He cried out in pain and collapsed. When it didn't work immediately, they wondered if it was a dud, but Beck and his ally fled when Mallen started vomiting a black tarry substance. Days later, Mallen slowly recovered, a mass of scabs, as the Extremis regrew his brain pathways and his internal organs. Within a few more days, though in incredible pain, Mallen became aware of his situation and his developing hew powers, his eyes and teeth bright red. (Iron Man IV#2) - Mallen went right into the FBI building and started attacking the agents there, brutally slaying them in a mess of blood and bone. He shrugged off their bullets and killed dozens of others by setting them aflame with fire from his mouth. Mallen returned to his allies, pleased with himself. (Iron Man IV#3) - Mallen was riding in the back of his van, thinking about his childhood, when the van was attacked by Iron Man (Tony Stark), who seared the van in half with his repulsor rays. Mallen easily survived the wreck and attacked the hero, refusing to stand down. He shrugged off Iron Man's repulsors, breathed fire at him, then grew small wires from his fingertips that overloaded the armor. Mallen tossed Iron Man into oncoming traffic and leapt after him. He was soon held off briefly by sonics, but managed to catch Iron Man's fist and crush his hand. After shaking off several small missiles, Mallen punched Iron Man's torso, cracking his armor. He then picked up a car and prepared to crush the hero. (Iron Man IV#4) - Iron Man managed to knock Mallen back with another blast, and Mallen chose to flee when he saw military helicopters surrounding him. He ran, at three hundred miles per hour, toward Washington, DC, to continue his attack. He stopped briefly to talk to a girl he thought he could relate to as she shared his distrust of the country and government. When it turned out she didn't, he decapitated her and continued running. (Iron Man IV#6) - Mallen arrived in Washington, DC, where he was attacked by Iron Man, unaware that Iron Man had now undergone the Extremis project himself. Mallen shrugged off several explosions, but he refused to yield. He fired an electric burst at Iron Man, who now appeared to be faster than Mallen. Iron Man sent Mallen flying through the air in an electrical explosion, then pounded Mallen through several walls. They continued trading punches, but Mallen refused to yield. Finally Iron Man blew a hole through Mallen's chest, then decapitated him. Mallen's body fell dead. 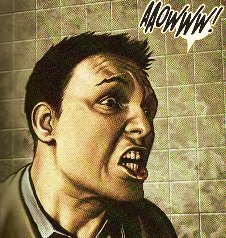 (Iron Man IV#10 - BTS) - One of Mallen's victims was revealed as Robert Montoya. Comments: Created by Warren Ellis and Adi Granov. (Iron Man IV#1) - In Bastrop, Texas, ignoring any reservations he may have had, Mallen had Beck inject him with the Extremis. He cried out in pain and collapsed. When it didn't work immediately, they wondered if it was a dud, but Beck and his ally fled when Mallen started vomiting a black tarry substance. Days later, Beck returned to find that Extremis had worked. 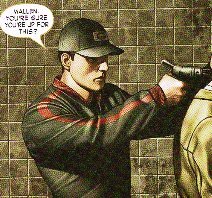 (Iron Man IV#2) - Beck and his ally picked up Mallen after he killed dozens at an FBI building. (Iron Man IV#3) - Beck's van was attacked by Iron Man (Tony Stark), who seared the van in half with his repulsor rays. Beck was presumably arrested.